Remember when thumbdrives with 2GB use to cost $60? Advancement in storage have made storage devices affordable. 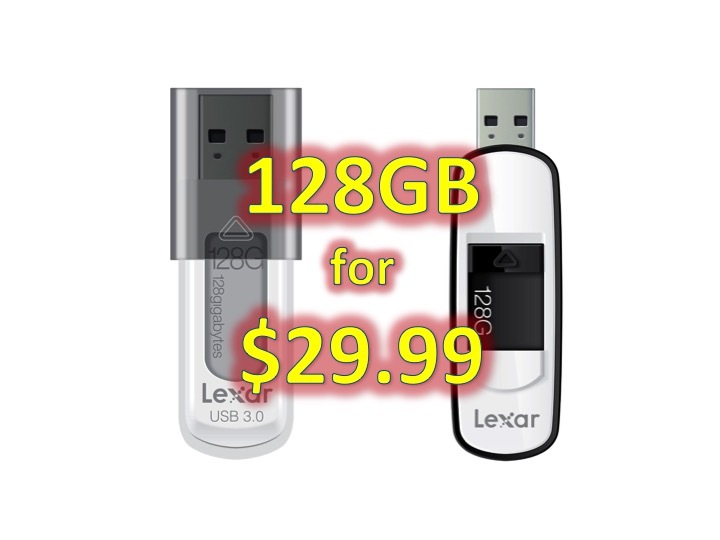 Now, Lexar is has two models of their 128GB thumbdrive for only $29.99. Both models, the Lexar JumpDrive S55 and the Lexar JumpDrive S75 are similar in specifications. In addition to the aforementioned 128GB of onboard storage, these thumbdrives can store and transfer content with SuperSpeed (fancy title) USB 3.0 technology (up to 150MB/s read and 60MB/s write). Both are compatible with Mac and PC – did we mention they were $29.99? One difference is ship date the Lexar JumpDrive S55 is currently not available and has a 2-5 week ship date and the Lexar JumpDrive S75 is available now. What can you store with 128GB? If you have a 16MP camera, you can store 22,888 photos or you can store 64 HD movies that are 2-hour long (each) or 16,000-18,000 songs. Is 128GB thumbdrive enough for you? I will probably pick one up and consolidate my other thumbdrives! Did you get one? Which model? Tweet us @AsianGeekSquad!